Culpeo Foxes are the largest species of fox in South America. They have a body length between 60 and 120 cms (23.5 - 47 inches), a tail length between 30 and 45 cms (12 - 18 inches), and they weigh between 5 and 13.5 kgs (11 - 30 lbs). They are grizzled grey in colour on their back and they are reddish/brown on their head, neck, ears and legs. Their long, bushy tail has a black tip. 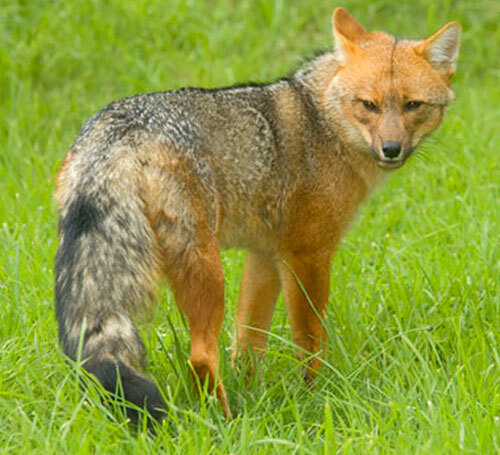 Culpeo Foxes can be found in the deciduous forests and grasslands on the western side of the Andes mountain range in South America. Culpeo Foxes mainly feed on rabbits, hares, lizards, birds, insects, eggs, fruit and carrion. After a gestation period of 55 - 60 days, Culpeo Foxes give birth to 2 - 5 cubs in a den.